The U.S. Men’s National Team comfortably cruised into the CONCACAF Gold Cup Semifinals with a 5-1 win over El Salvador on Sunday afternoon at M&T Bank Stadium in Baltimore, Md. Clarence Goodson, Joe Corona, Eddie Johnson, Landon Donovan and Mix Diskerud all scored in the rout. The U.S. will now face Honduras on Wednesday at Cowboys Stadium in Dallas, Texas with a spot in the final on the line. Mexico and Panama face off in the other semifinal. The U.S. had the game’s first chance in the 14th minute when former New England Revolution star Michael Parkhurst found some space on the right flank. Parkhurst sent a low cross to Mix Diskerud, who had space to shoot in the box, but whiffed his shot, wasting a great chance. Clarence Goodson gave the U.S. the lead in the 21st minute on a designed short corner kick. Joe Corona played the ball to Landon Donovan, who then found Parkhurst. Parkhurst played Donovan behind the defense, and he slid a pass across goal that took a deflection, but found Goodson, who blasted it in from close range. Nick Rimando kept the U.S. ahead in the 25th minute with two incredible saves. He first denied Andres Flores from point blank range with an incredible save and then off the rebound tipped a shot by Rodolfo Zelaya off the post and out for a corner. The Americans doubled the lead in the 29th minute when Chris Wondolowski found Joe Corona at the top of the box. Corona took a couple touches to gain space in a crowded defense and then hit a low shot inside the post to make it 2-0. Donovan nearly added to the lead a minute later when he was played behind the defense, but he attempted to chip the keeper and didn’t weight it correctly, allowing for an easy save by Dagoberto Portillo. Parkhurst then had a chance for his first international goal in the 34th minute after Corona played him into the right side of the box, but he was unable to beat on onrushing Portillo, who parried his shot wide for a U.S. corner kick. Portillo came up big again three times in the next three minute, saving a Corona header off a corner kick and then denying a Donovan shot after a nice set-up by Beasley. Portillo then made a stunning save on a powerful shot from Corona that may have deflected off a defender’s arm before it was cleared off the line. Zelaya pulled one back for El Salvador in the 38th minute after tearing through the U.S. defense and then going down under obstruction from DaMarcus Beasley. Zelaya stepped up to take the penalty and chipped it down the middle with Rimando diving to his left to cut the deficit to 2-1. El Salvador came out the aggressor to start the second half with several dangerous chances, but the U.S. had a dangerous oppurtunity in the 53rd minute on a long range effort by Kyle Beckerman. Portillo could only push the ball wide and it fell to Chris Wondolowski who hammered a pass across goal. The ball fell just out of reach of Donovan and others who had an open net to look at. Eddie Johnson came off the bench in the 61st minute when the U.S. earned a corner kick and made an instant impact. Immediately after jogging from the sidelines into the box, Johnson got on the end of a Landon Donovan cross off the corner and rocketed a header into the back of the net. 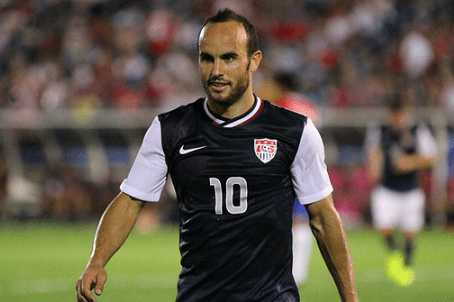 Landon Donovan then put the game out of reach in the 78th minute when Johnson flicked a long goal kick from Rimando behind the El Salvadoran defense. Donovan used his pace to outrun the defense, round the keeper, and then slot it into the net to make it 4-1. The U.S. wasn’t done scoring yet, however, and Mix Diskerud finished off a Donovan cross with a header from close range to make it 5-1 in the 84th minute. Donovan nearly added another goal in the 86th minute, but his powerful effort from close range was cleared off the line by Mardoqueo Henríquez. Johnson and Shea both had late chances to add to the lead, but saw their efforts saved by Portillo.